This past week one of my customers who is a Visual FoxPro 9 developer emailed asking for help installing the Visual FoxPro 9 IDE on Windows Server 2016. His description of the process was that the Microsoft installer begins, shows the icon on the taskbar, and dies immediately. It does not even start to present the standard installer user interface. His normal application installers for a Visual FoxPro app install fine, but the Visual FoxPro 9 installer from Microsoft does not. He tried installing from the install CD, a USB stick, and an ISO with the same results. I recommended trying to Run as Administrator, but that also did not work. Since it was not even giving him the user interface, it could not be a problem with permissions to the designated folder or something along those lines. 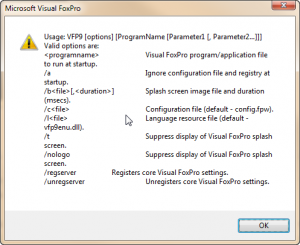 Knowing I have run Visual FoxPro 9 from a USB thumb drive, I figured we could copy over the development folder from one computer to another and get things working so I recommended the following steps to him. Copy an existing Microsoft Visual FoxPro 9 folder from a different machine to the Windows Server 2016 machine. Start the CMD.EXE in Administrator mode using the Run As Administrator option. From the Windows Command Window, change directory to the VFP folder on the server. Run Visual FoxPro 9 to test the install. I also provided him a link to the MSXML 4.0 Core Services in case this was not installed on the server. One other thing I do when I am setting up a new computer (it has been 2 years since I have had to do this) is to export the VFP9 registry using RegEdit, and importing that by double clicking on the REG file that I exported. This moves over all my favorite Visual FoxPro settings and preferences. Hoping this helps out someone else along the way. I’ve never run a server operating system on my development machine and don’t foresee the need to do so anytime soon.